Jeannie grew up in South Carolina with her sister, Margaret, who has done a few guest posts here on the blog! After college, she lived and worked in Washington, D.C. for a decade where she met and married Jesse. 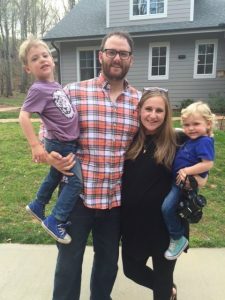 Jesse grew up on Cape Cod, and slowly they felt God calling them to leave D.C. and move to the Cape to be a part of a church planting situation there. They moved to the Cape 2 years ago and it’s been a hard transition in many ways, but their hearts are heavy with the need for the Gospel in the New England area and for Christians there to be encouraged. Jesse and Jeannie have 2 children, Margaret (7 years old) and David (5 years old), and a baby girl due early December. You might be trying desperately to avoid the fact that life is messy. Or you might be so aware of how messy life is that you don’t want to get out of bed in the mornings. How do we provide structure while also being flexible to the unpredictable realities of life? How do we show the Gospel of Grace while also setting clear boundaries from an early age? How do we foster a sense of the priority of our family relationships while also reaching out to those who are most lonely and marginalized in our community? How do we prioritize teaching our children true and beautiful things while simultaneously exhibiting love in action and responding to the needs of others? When do we give a second chance or know when to kick the rebellious teenager out of the house when their choices are so destructive it could cost them their very lives? How much do we protect our children from evil and confusing messages? Do we spend over our grocery budget to exclusively buy organic chicken for our children or throw packs of the “buy one get one free” deal chicken in our cart and give more the child in a 3rd world country who needs a simple meal? The questions and dilemmas and second guessing can go on relentlessly. And our current cultural moment, Google, and pressures are not helpful in our fight for balance (and sanity!). What’s right for one family will probably look very different for your own. There are guiding principles and then there’s the million of gray areas that we’ll find ourselves wading into each day as we raise our children. To receive further encouragement on the messiness of life but the faithfulness of God, connect with Susannah this week on Facebook. This week, you and I have the privilege of hearing again from Margaret Austin. She shared a post with us in June entitled Motherhood as Ministry. If you missed it, make sure to click here to check it out. Today, she shares with us again from the trenches of motherhood, so if you are in a tough spot and need some encouragement, pull up a chair, and enjoy Margaret’s wisdom, wit, insight, and bold love. Just to give you a recap on who Margaret is and how we know each other, I met Margaret five years ago when she had just moved to Houston and was pregnant with her firstborn. Her husband, Thomas, played for the Houston Texans, but Houston was only blessed enough to have Margaret and Thomas here for a year before they moved again. In the past five years, they have moved ten times because of Thomas’ career in the NFL, and Margaret birthed three babies in that time period – Adam (4 years old), Isaiah (2 years old), and Hazel (4 months old). After watching and admiring Margaret, I’m pretty sure NFL wives are just as tough as their husbands! In the past year and a half, Thomas has transitioned from playing football in the NFL to coaching football at Clemson in South Carolina. Yet through all of the moving, transition, babies, and change, Margaret has remained…Margaret. She is beautiful, bold, never afraid to tell you like it really is, but never afraid, either, to obey the Lord and walk in obedience that path He has for her (even when it hurts). Over the past five years, Margaret has made God more real and beautiful to me, and I know she will do the same for you as she shares encouragement straight from her heart and straight from the trenches of toddlerhood. Margaret Austin here again, writing to you from the youngest years of motherhood. It has taken me over 2 weeks to complete this post because every time I sit down, someone needs a snack, wakes from a nap, needs to nurse, cracks their tooth on their stick horse, or jumps from the coffee table onto the couch for the 1000th time. So when I say I understand how the little years are, I promise you, I understand. One of the ways I’ve specifically been praying that my children would learn to push back the darkness is by how they treat people who are not like them. Whether it is someone who has a disability, a different skin color, or is from a different socio-economic class, I want my children to learn to move towards these people, not away from them in fear of their differences. When we lived in New England, I worked with children on the Autism spectrum. We would take trips into the community to teach them life skills, and one thing that bothered me the most about these trips is the way people would either 1. stare and openly gawk or 2. hurry by with their heads down and never acknowledge my students. I hope that I can model for my children ways that we can move towards other human beings who may not look like us and treat them with warmth and dignity. I want my children to see me look people in the eye, ask their name, and move towards others. Oftentimes the way I see the darkness rear its ugly head is when people are fearful – they fear those with disabilities, anyone who doesn’t look or act or dress like them, and they move away in fear. But I think that Scripture speaks towards social justice issues repeatedly for a reason – we are called to push back the darkness by pushing towards those in need and in positions where they can be left unnoticed. I ask my children to look the cashier and bag boy in the eye and tell them “thank you,” which in turn convicts me to do the same! The other way I am attempting to teach our children to push back the darkness is by being respectful towards other and owning up to their wrongs. I don’t just mean saying “yes ma’am” or a half-hearted “I’m sorry.” I especially want to teach my boys that they are to respect other’s bodies. This means we don’t kick, hit, punch, etc. Now, our family lives in a world of football and wrestling and going on bear hunts, so we are attempting to differentiate the difference in mean play versus when it is OK to play rough. (Any tips are welcome!) This has spurred me to pray that the Lord will open my eyes to my own sin first, and then to my children’s sin so that I can help them push back the darkness in their own hearts by owning up to their sin and asking others for forgiveness. Right now, my children are 4 years, 2 years, and 4 months old, so we learn these things in age appropriate ways. I have to remind myself that teaching in these small moments and in ways will hopefully add up over time, along with the conviction of the Holy Spirit that will come from the inside out. Our pastor preached last week on what it means to “crush Satan’s head” (Romans 16:20) in our daily lives, and I felt like he directly spoke to this issue of “pushing back the darkness.” He said that we can crush Satan every day by living out the Gospel in our homes, workplaces, and schools. When we offer ourselves as living sacrifices (Romans 12:1), and we respond to Satan by speaking the Hope of Christ to ourselves, our children, and those we come in contact with, we can push back the darkness and crush the head of Satan. What ways can you help others in your life push back the darkness? Motherhood is tough. Especially motherhood in the younger years when everyone is in diapers and needs a hand, needs help, and needs Momma! Sometimes (or, let’s face it – all the time!) mothers of toddlers and newborns need direct and special encouragement from the Lord that the work they are doing is significant, does not go unnoticed, and will not be in vain, no matter how many times your two-year-old has thrown himself on the floor today and yelled, “Mine!” I can’t think of a better person to provide that encouragement than Margaret Austin. I met Margaret five years ago when she was pregnant with her firstborn, and it was instant love, connection, and admiration for this dear friend! 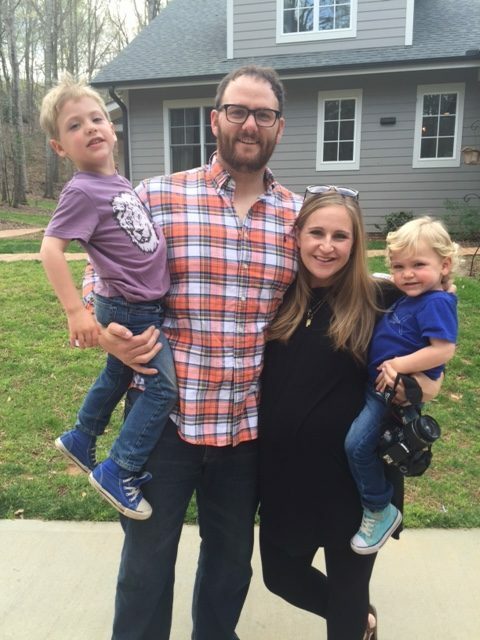 In the past five years, Margaret and her husband, Thomas, have moved ten times because of Thomas’ career in the NFL, and Margaret birthed three babies in that time period – Adam (4 years old), Isaiah (2 years old), and Hazel (9 weeks old). After watching and admiring Margaret, I’m pretty sure NFL wives are just as tough as their husbands! In the past year and a half, Thomas has transitioned from playing football in the NFL to coaching football at Clemson in South Carolina. Yet through all of the moving, transition, babies, and change, Margaret has remained…Margaret. She is beautiful, bold, never afraid to tell you like it really is, but never afraid, either, to obey the Lord and walk in obedience that path He has for her (even when it hurts). Over the past five years, Margaret has made God more real and beautiful to me, and I know she will do the same for you as she shares encouragement straight from her heart and straight from the trenches of toddlerhood. Hi friends. Margaret Austin here, friend of Susannah. I got to know Susannah when my husband Thomas played for the Texans from 2011-2012. God placed Susannah and Jason in our lives at a time when we knew no one and desperately needed some friends! They had us over for a meal & we instantly loved them. I guess they loved us too because they let lonely me come over and spend the night quite often when Thomas was playing in away games, and we spent Thanksgiving and Christmas with them that year. Susannah was such a dear friend to me, especially as I had our first son while we were living in Houston. She let me tag along on playdates, bible studies, & swim lessons. God continued to cross our paths even after we left Houston through The Seed Company, a Bible translation company affiliated with Wycliffe. Susannah and I share a love for a man named Bernie Mays. 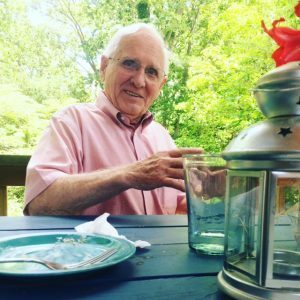 Bernie is 84 years old and his life’s work has been translating the Bible for Bibleless peoples. Bernie began his career by flying linguists up and down the Amazon in Peru. Later in life Bernie helped start The Seed Company and was president for many years. Now Bernie is passionately supporting a language project in Asia, caring faithfully for his wife, Marian, and still flying his own plane. In fact, Bernie flying his own plane is why Susannah even asked me to blog in the first place. Thomas and I got to know Bernie better when we lived in Charlotte, NC as he resides just outside of Charlotte. After we moved to Clemson, South Carolina last year for my husband to coach football, Bernie flew down for lunch with a fellow Seed Company employee. He flew down for lunch again last week. But Bernie (and the Holy Spirit) knew just what my tired soul needed. Bernie started talking and he didn’t come up for air for about 15 minutes. He began telling me he admired me?! What on earth would an 84 year old man who spent his life doing important work for the Lord have to admire about a worn out stay at home mom? Bernie told me that he wanted me to know that my work as a mother was important, that I had no idea how God would use my children in the coming years or how my work might come to fruition. He told me that he’d struggled when his family lived in the jungle with whether or not he was doing the right thing for his family, living in such extreme circumstances. He’d wanted a comfortable, 9-5 life at times. But he’d pressed on and continued because this was where he felt God calling him. All tears forever over in God’s eternal day. Let Jesus solve your problem – just go to Him in pray’r. The tempter will be banished, we’ll lay our burden down.